Torx T10 driver used to remove star shaped security screws on the PS3 Fat and Xbox 360. Torx T8 driver used to remove star shaped security screws on the PS3 Slim and Xbox 360. Screw driver that can easily remove the Y-shaped screws on many Nintendo products. This is a high quality triwing screwdriver that you need to open your Nintendo Wii, DSi, Lite, 3DS, Game Boy Advance, SP and other systems and accessories without stripping the screws. Use this driver to remove the security screws on many game consoles. Includes bit and driver. 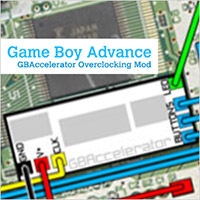 Overclock or underclock to change the speed of your GBA or SP on the fly. Great for emulation, homebrew games or apps, music or adjusting the difficulty level of your favorite game. 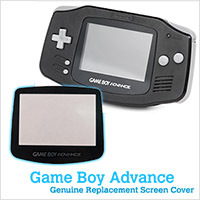 Genuine Nintendo official replacement screen cover kit for the Game Boy Advance. Includes cover, removal tool and instructions. Update: VERY Limited Quantity - Order before they're gone forever!